I know I’m rather late in wishing you Ramadan Mubarak, but if you follow me on Facebook or Twitter, I was wishing my followers as soon as reports of the crescent moon had been sighted were confirmed. In Ramadans past have you ever felt that you weren’t able to accomplish much, or that you were unproductive, or though you wanted to be more spiritual this month and you weren’t? Did you feel guilty or subdued and wondered how you could have a better Ramadan? What if I told you there are resources and tools out there to help you have the best Ramadan ever! I meant to do this post on how you can make the most of this blessed month and how to prepare for Ramadan two weeks ago, but due to personal commitments I couldn’t. Ramadan isn’t over yet so I decided to go ahead and share with you some of the resources and tools out there that I think will help you get more out of this Ramadan. 1) Quran Explorer I just love this site. You launch it and you can read the quran on your iPad/laptop/PC, you can listen to various recitations, by well known Qaris such Sheik Sudais, Shuraim, Mishary Al-Afasy and many more. You can also read or listen to the interpretation of the meaning if Arabic isn’t your native language. Ramadan is the month when Angel Jibraeel used to revise the Quran with our Prophet (peace be upon him), and you should make an effort to try and complete the Quran once in this month..and then develope a habit of daily recitation in other months. 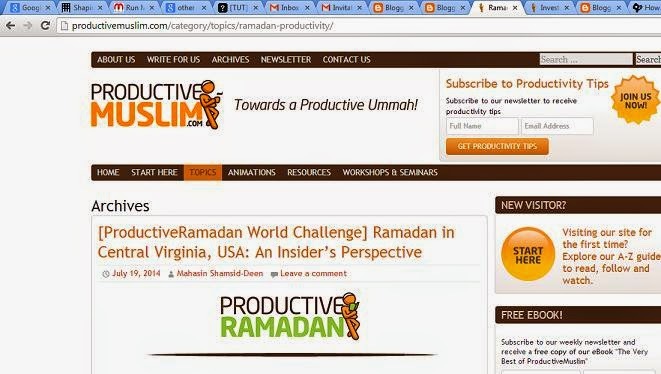 2) Productive Muslim‘s fabulous daily tips on how to have to Productive Ramadan are the very motivation I need to keep upbeat and prevent me from slipping into a lazy stupor while pre and post the iftar! Sign up for their Ramadan newsletter for a short and sweet practical tips on how to increase your productivity and spirituality this Ramadan. 3) iloveAllaah.com is another great site with lectures, articles and more what I particularly like is their checklist that’s been circulating on Facebook. It’s covers things that you can incorporate in life after Ramadan as well, but you can use Ramadan as a boot camp and be extra spiritually productive and reap the many rewards. 4) Duaa, it is the single most powerful tool we have. Make lots of duaa, wherever you are, whatever your situation, when ever you want, but in the last third of the night before iftar, and between the adhaan and salaah, ask for forgiveness, for mercy, for guidance, whatever you want, for peace and security for all of us, and remember me in your duaas too! Love it…thanks for posting this!